Lisa will be squawking baseball with Mike Lindsley of Syracuse's The Score 1260 at 1:30 p.m. today. If you are in the Syracuse area, you can listen to her on 1260 AM on the radio. If not, check out the station's web site and listen to her there. Thanks! Sunday night's Yankee win was a good start to the playoffs. Monday night, not so much. CC Sabathia actually looked like an ace again in Game 1, and the Yankees just destroyed Baltimore Orioles closer Jim Johnson. Johnson, who led the league in saves with 51, gave up a homer, a double, three singles, and five runs (four earned) in the ninth inning. To put that in perspective, Johnson only gave up 21 runs (19 earned) in the entire 2012 season! As for Game 2, I was at the Jets game (my first NFL game ever!) so I missed watching it live. (Sorry, but I got free tickets. Wasn't going to turn that down!) Lots of "Tebow" chants. The game was closer than expected, but Mark Sanchez just isn't a very good quarterback. Anyhow, I did hear all the A-Rod complaints after Game 2, but I also heard the same people caterwauling about him after Game 1, when the Yanks actually won the game! What's up with that? I do think he needs to be moved down in the lineup, because it gives the Yankees a better chance of winning. Ken Davidoff's column today is much of how I feel on this, although I would bat Granderson or, when he's playing, Ibanez at fifth, not Swisher, and have A-Rod at sixth. Six years ago, in the ALDS against Detroit, Joe Torre see-sawed A-Rod up and down the team’s lineup — from sixth to fourth to eighth — while also tinkering with Melky Cabrera, Jason Giambi, Gary Sheffield and Bernie Williams. No one could figure out the rationale behind the Yankees manager’s addition and deletions. Especially since Rodriguez still ranked as an elite offensive player. To the contrary, everyone would understand if Girardi finally cleared A-Rod out of the prestigious third spot and sent him on a good trip down the starting nine. In this emotional time, the Yankees must let common sense rule the day. And common sense says that A-Rod simply isn’t a No. 3 hitter right now. As infuriating as the Yankees blowing a 10-game lead in the American League East was, one thing it did do was get the Yanks to focus again. There wasn't going to be any coasting and saving players for October, like we've seen in previous years. Instead, the Yankees got their groove back and won the division. They played some of their best baseball of the season down the stretch, and earned that AL East title on the last day of the year. The other thing is that the Baltimore Orioles finally got taken seriously by the Yanks -- and their fans. For most of the year, it seemed like the O's were going to fade. It didn't seem possible that they could really contend for the whole year. A few times in the recent past, most notably when Lee Mazzilli was manager, Baltimore looked great in April and May, but faded as the summer heated up. But this year, they never faded, and finished with just one fewer loss than the Yanks. Then they beat the defending AL Champion Texas Rangers in that one-game playoff. Anyhow, this Yankees-Orioles matchup is intriguing, and more than a little nerve-wracking. 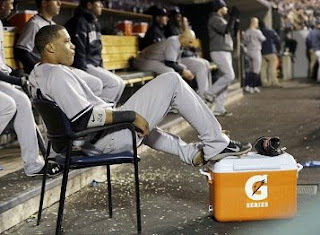 Even if you are rooting for the Yankees, as I am, you can't help but admire what Buck Showalter has done. Hats off to him for this season. If the Yankees weren't in it, I would root for the Orioles to go all the way. But that was B.S. -- Before Showalter. He took over later that summer, and turned around the franchise. It really is remarkable, given that the O's aren't exactly laden with great pitching, or any real superstars. And I hope that the Yanks take this series seriously. I think they are. They can't be complacent, as I think they've been at times in the postseason, and think that all they need to do to beat the Orioles is throw their gloves on the field. Baltimore is a force to be reckoned with, and I hope that the Yanks come out fighting tonight. Yankees in 5. I hate to admit it, but Squawker Jon was right. Before the Yankees-Red Sox series, Jon and I had very different opinions on what would happen. I feared that the Sox would stick it to the Yankees over the last three games of the season as much as possible, and would try to end their season on a high note, by keeping the Yanks from winning the AL East. Jon figured it was just as likely that Boston would mail it in to make absolutely certain that Bobby Valentine wouldn't be back. And guess what? The Red Sox got swept, with Valentine himself helping to make sure that this would be his swan song (no pun intended) with Boston. How sweep it is! Not to mention Valentine trashing his coaches on the radio before the game. To top it all off, I just read that Curt Schilling might lose the bloody sock, because he put it up as collateral with his ill-fated loans for 38 Studios. How low can the Sox go? 7 #RedSox on the field for the anthem. Valentine, 6 players, no coaches. Class all the way, this bunch. Pedroia (standing alone), Lavarnway and Quiroz (heading to the bullpen), Ellsbury, Ross, Ciriaco in OF. And most importantly, you had the Yankees win, clinching the AL East on the last game of the season and celebrating at home. 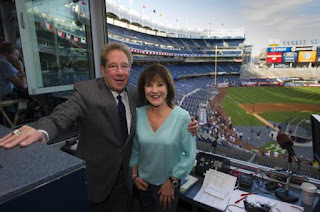 The house was rocking, last night, too -- it was the loudest I had heard Yankee Stadium this year. I was glad there wasn't the whole pile of players jumping on top of each other. Aside from it not really being appropriate, given the Yanks did blow a 10-game division lead before finishing on top, I worry that somebody could have gotten hurt. These days, you can never be too careful. Anyhow, I enjoyed the game, and the postgame celebration, and the fact that the Sox were utterly humiliated. I did not switch the game to watch the presidential debate; I watched that replay later. But I did switch during that game to watch Triple Crown winner Miguel Cabrera, and I also got to see him getting taken out of the game to a standing ovation from the Kansas City crowd. Warning: AL MVP rant ahead! A month ago, I would have said Mike Trout should have been the AL MVP. But between Cabrera's torrid September (following a torrid August), his leading the Tigers to a division title, and him winning the Triple Crown, he should be the runaway winner. And frankly, I don't understand the media folks who minimize what Cabrera has done this year, and denigrate those who support him as "truthers" (Jeff Passan) and irrational minds who would prefer their doctors still use leeches (Keith Law.) There's no need for that. Using WAR, a formula where there is no clear agreement on, and in which the value can change from year to year on previous numbers, seems to be a very flawed way to pick the MVP. And putting down the Triple Crown is bizarre. Baseball is all about the numbers, after all. Cabrera didn't just win in three important categories; he also won in OPS (on-base percentage plus slugging) with a .999; Trout had a .963. And in the last 30 games of the season, Cabrera had a 1.066 OPS, with 11 homers, 28 RBI and a .324 batting average. Trout had a .948 OPS, with a .297 batting average, 5 homers and 9 RBIs. Sure, Trout is better on defense, but Cabrera switch positions from first to third this year so the Tigers could sign Prince Fielder. If that isn't a sign of "loyalty," one of the criteria the BBWAA writers are supposed to determine the vote on, than what is. Anyhow, back to the Yankees. It's a good day; I'm still basking in the afterglow of last night's win!